Yakanalit is a small slaver hideout on an island northeast of Bal Fell. There are five hostile bandits and six slaves here. This cave makes an excellent place for beginners to scavenge, as the hostiles are not overly powerful and it holds an extremely high amount of loot for a cave of its size and difficulty. There are an impressive number of crates and barrels here. The random, leveled loot here includes: gold, gems, potions, alchemical ingredients, scrolls, weapons, armor, various sundries, skooma, moon sugar, soul gems, clothing, jewelry and magic items. There is a locked and trapped chest in the east room behind some screens containing a fair amount of gold. There is a locked and trapped chest in the north room behind some hammocks containing a fair amount of gold. The only slave key in this location is on the table in the east room, on top of a piece of paper. 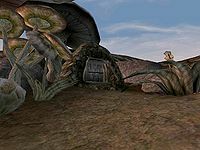 Tininnus Scinia may have family in Cyrodiil, as a fort in the eastern part of that province - near Morrowind - is called Fort Scinia in Oblivion.